November 8 was a good day for graduate student Brandon Farmer. First, his abstract was selected for an oral presentation at the Southeastern Regional Lipid Conference. Second, his well-received seminar led to a conference Travel Award. Finally, Brandon capped off the day with a notice of award for his successful American Heart Association Predoctoral Fellowship! Congratulations Brandon! Congratulations to Brandon Farmer, whose abstract was selected for an oral presentation at this year's Neuroscience Clinical-Translational Research Symposium. His talk, titled "APOE Genotype Effect on Respiratory Quotient – A Potential Biomarker for Alzheimer’s Disease Risk", focused on the early results of an ongoing clinical research study. Thank you to Brandon, DJ Carter, Rebika Khanal, and Grant Nation for all their hard work on this study. Holden is awarded a NIH T32 Fellowship! ​Graduate student Holden Williams was recently awarded a NIH T32 Fellowship through the "Graduate Training in Integrative Physiology" Program. The competitive Fellowship will facilitate Holden's training in clinical and translational research, and will provide numerous opportunities for him to expand his budding research projects into new and exciting areas. Brandon awarded a Fellowship for Excellence in Graduate Education! Graduate student Brandon Farmer was recently awarded a Graduate Fellowship for Excellence in Graduate Education from the UK College of Medicine. Only six of these merit based awards were given out to graduate students within the College of Medicine. Lab awarded an NIH/NIA R01! The Johnson lab just received a grant from the National Institute of Aging to study the effects of APOE on Alzheimer's Disease. This 5-year project will focus on the link between glucose metabolism and oxidative stress in the Alzheimer's brain. We are thrilled to begin this exciting research with the support of the NIH! Lance enjoyed talking about the lab's recent work at the Neurobiology of Brain Disorders Gordon Research Conference, in Barcelona Spain. The title of the talk was "ApoE Isoform-Specific Effects on Glucose Uptake & Glycolytic Activity in Astrocytes", and focused on the alterations in energy substrate imbalance that the lab has observed in human apoE expressing neurons and glia. ​Our proposal entitled “APOE and the Inverse Warburg Effect” has been approved by the NIH Common Fund Metabolomics Center for funding! With the help of the UK Center for Stable Isotope-Resolved Metabolomics (SIRM), we will conduct studies designed to "track" glucose utilization in E4-expressing mice and neurons. ​The Scientific Reports manuscript by Dr. Johnson and his colleagues at OHSU has been named Oregon Health & Science University (OHSU) paper of the month. 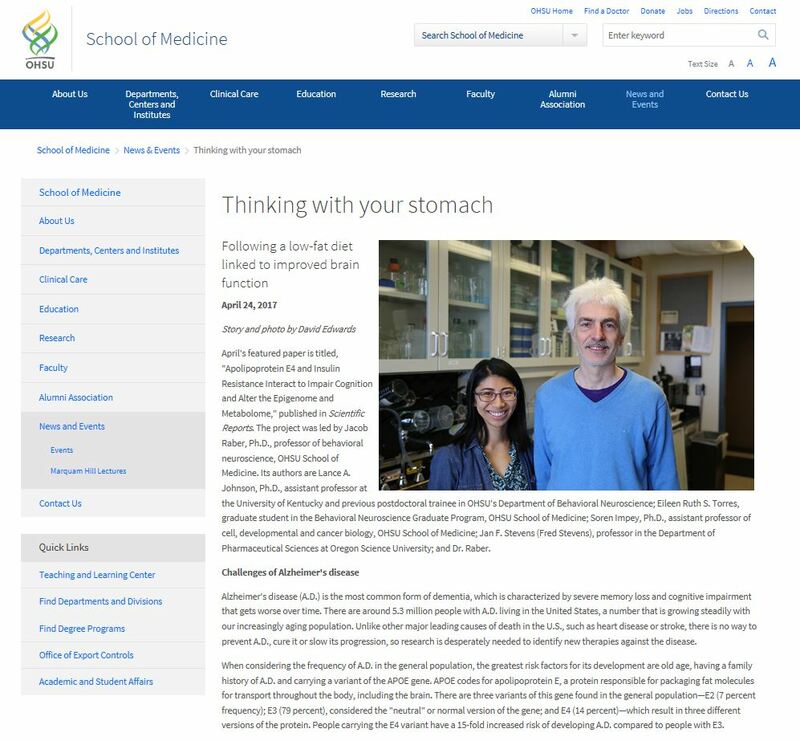 The research was highlighted in the OHSU news, and featured interviews with co-author and graduate student Eileen Torres and principal investigator Professor Jacob Raber. Dr. Johnson has been named a Junior Investigator as part of UK's multidisciplinary Center of Biomedical Research Excellence (COBRE), directed by Dr. Lisa Cassis. Dr. Johnson joins four other new investigators as part of the Center of Research in Obesity and Cardiovascular Disease (COCVD) at UK, which is supported by a $11.3 million, five-year award (P20 GM103527) from the National Institute of General Medical Sciences (NIGMS). His proposed research focuses on "ApoE and Energy Substrate Metabolism".